Oft-discarded broccoli stems are the star of this delicious side dish, which pairs them with chile, almonds, preserved lemon, and an umami-forward vinaigrette. Maria Hines tames the stems’ tough texture with a quick sear in canola oil, which she recommends for its high smoke point and neutral flavor. 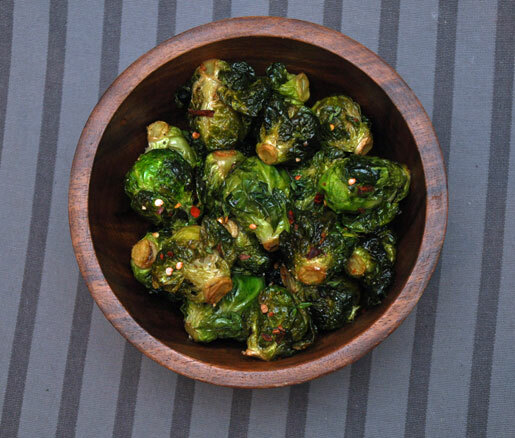 Make the charred broccoli: preheat the oven to 350°F. Spread the almonds out on a small baking sheet and toast in the oven until they’re lightly golden brown, 7 to 10 minutes. Peel the broccoli stems to remove the hard outer layer. Slice the stalks into thin slices to sear. Add the oil to a heavy-bottomed frying pan set over medium-high heat. When the pan is hot, almost at its smoking point, add the stems and sear for about 20 seconds. 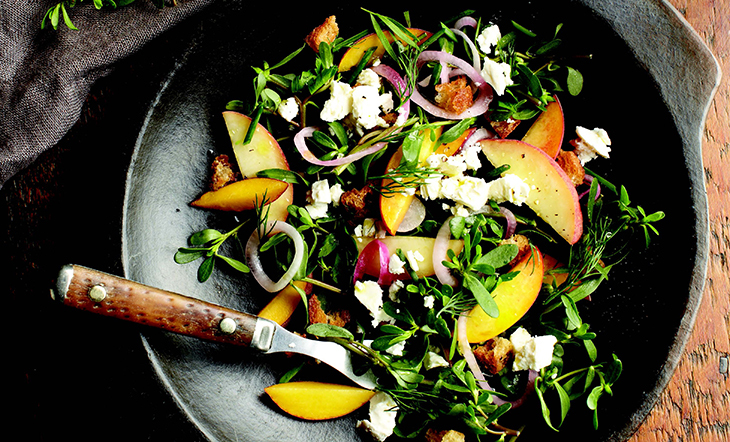 (Depending on the size of your pan, you might need to work in batcheEdit Recipes —you won’t want to add more than a single layer so that each piece can caramelize evenly.) Season the broccoli with salt and let it sit for about a minute. Flip the stems over and season with another sprinkle of salt. Once both sides are seared, about 2 minutes total, add the garlic and chile flakes, and stir. Add the lemon juice and ¼ cup water to the pan and season with a pinch of salt. Once the liquid evaporates, about 5 minutes, the broccoli should be tender. Make the anchovy vinaigrette: add the anchovy fillets, vinegar, shallots, and water to a blender. While the machine is on, slowly pour in the canola oil until the vinaigrette has thickened and emulsified. Season to taste with salt and pepper. 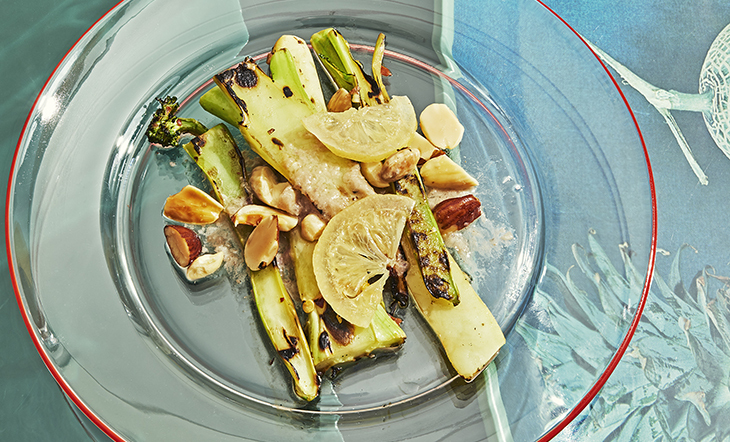 Transfer the charred broccoli to a serving platter, drizzle with the anchovy vinaigrette, and garnish with the preserved lemon and toasted almonds.